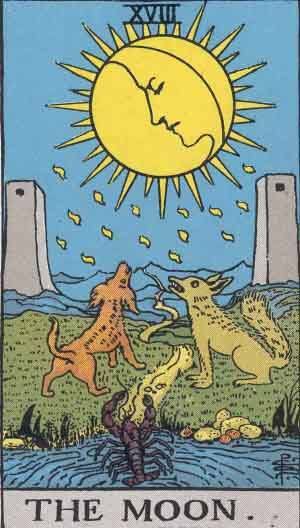 The Moon is the 18th Major Arcana card. A well known Tarot card, showing as much duality in the rider-Waite illustration as it represents. The Moon is one of the major celestial objects which we see, and is extremely prevalent in mystical tradition as representative of the feminine. The Moon shows a lack of clarity; something you might be half-sure of or a concept you’re just grasping. Past – The Moon in the Past position might mean that you’ve remembered something in the past incorrectly. It could be an event of how you have perceived a person. Have you just seen somebody recently after a long time? They’ve likely changed by now. Have you witnessed an event that is coming up in conversation now? Be careful not to exaggerate, even if it is human nature to. Present – The Moon in the present position could mean that something is about to happen, or is currently happening that you can’t initially understand. Unlike The Fool, you aren’t completely ignorant. You might expect an outcome that won’t occur, or things might not go to plan. The key is a lack of clarity. We worry about the unknown. A fear of the dark is not a fear of a lack of light, it’s the fear of what you can’t see. You won’t ever see unless you go out there. Future – The Moon in the future position may mean that you’re unsure of where your life is going. It isn’t an exaggeration to say that everybody feels this way, even the people with the most cemented views on life. You just can’t know. We perceive time linearly, this is a rule you cannot break. Spend less time worrying about the future and more time bettering the present. You are only ever here and it is only ever now. Work / Education – The Moon in regards to work or education means that you might not be grasping the bigger picture of things. Don’t worry about your own perception; things are purposely being kept from you, or not being discussed generally. Ask around to see if there are any rumours floating around. in education, you may be doing worse or better off than you think you are. Ask a teacher or lecturer about how you think you’re doing and find areas to improve on. Romance – The Moon in romance may indicate an argument, either ongoing or about to spark. It’s likely due to something being hidden from either of you. If a relationship is expected to last, you have to practice complete openness. What doesn’t bother you might bother your partner. The reverse is also true. Make sure you’re open with each other as much as possible. When you do argue, take some time to cool off. Don’t act instantly on emotion. Friends – The Moon in regards to friendship really highlights the lack of clarity you may be feeling. Your friends may know something you don’t know, or they may be meeting up without you. Additionally, if you’re trying to block out a friend from your circle, he may have caught what you’re doing and mean to talk to you about it. There’s no point lying. Money – The Moon in regards to finances means you might be a bit scared of your current financial situation. You need to be practical and logical and examine all of your incoming and outgoing money. Make sure nothing is being hidden from you. Check your bank statement, and check your pay-cheque to make sure nothing is staying hidden. Health – The Moon, at face value in health, strongly suggests that a checkup with the doctor might be worth it, at least to put your mind at ease. You might have a minor condition now that can be stopped. If something is bothering you, don’t be afraid of the doctor. make sure you don’t overindulge. When we’re scared and unsure, it’s a reaction to start eating, due to the comfort provided. Spirituality and Mentality – The Moon means now is a very spiritual time, and you might feel in touch with the world. Make sure you’re not led astray by anything and stay clear on your path. Are you currently unhappy about something? Has a situation ion your life suddenly just become more complex? You may feel like everybody is waiting for you to do or say something, but the pressure is just becoming too much. Consider the small picture, and take things in little steps. It’s natural to worry when under pressure, but you always have time to stop and think about any situation. We build things up in our head to be much more stressful than they actually are, and once it’s over, it’s over; we can learn to cope. We’ve selected live tarot readers to give you a FREE 3 Minute interpretation of the Moon! Scroll through them below and pick your favorite one.